It really was a perfect Fall evening. We are soaking up all the time we can together because Johnny is going out of town for the weekend. The girls and I are going to cram in as many fun things as possible like park time, special restaurants, and lots of crafts (after Poesy is asleep, of course). Have you seen any especially good crafts around the web lately? I'd love some suggestions! That is the cuuuutest dress, oh my word! was hoping to find some new crafty inspiration in the comments but will have to check back later. Sooo pretty! I love that little bow! that dress is insanely cute! I love this outfit! I'm experiencing some serious frock envy right now. :) And those flats are killer. Ooooh, thank you, Dee-- I'll be sure to show her! Faith, we will have to try some of those out!! I love love love love those shoes!! Really pretty dress, I love that colour, it goes so well with your hair! 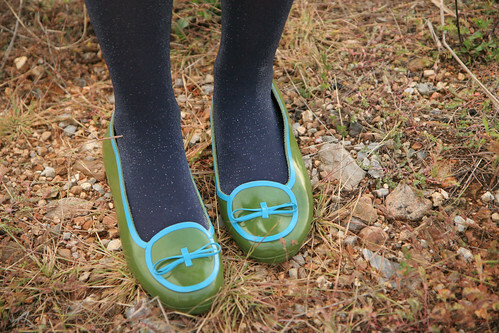 Super cute shoes, I want them :) You are so beautiful! I love a date night so much fun! Ahh, plastic spiders! My dad and I had a game with those where we put them in each other's beds for years! Makes me miss my dad. Thanks for bringing back a great memory. What a cute dress! You look lovely. I love those shoes! The color combination is killer. 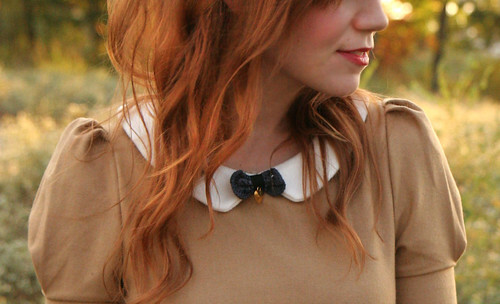 the color of your hair fits in perfectly with fall! youre a fall DREAM! i love the little baby bowtie. i actually have an outfit planned for tomorrow with one!! I found your blog from smile and wave! I really enjoy your blog and look forward to following it! Love your skunk boy creatures, super cute! Fun blog! cuteeee dress. that collar just kills me. I think it'd be fun for kids to do, too.